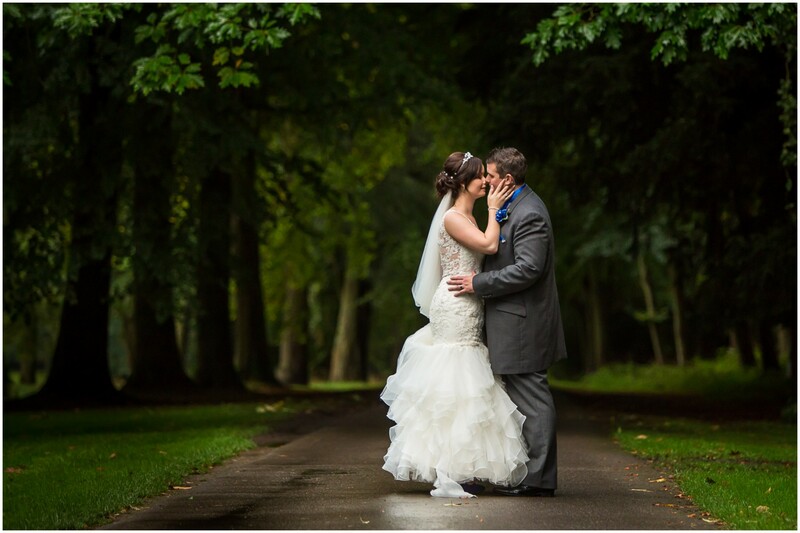 Bowood Hotel wedding photographry on a wet, wild and windy day. 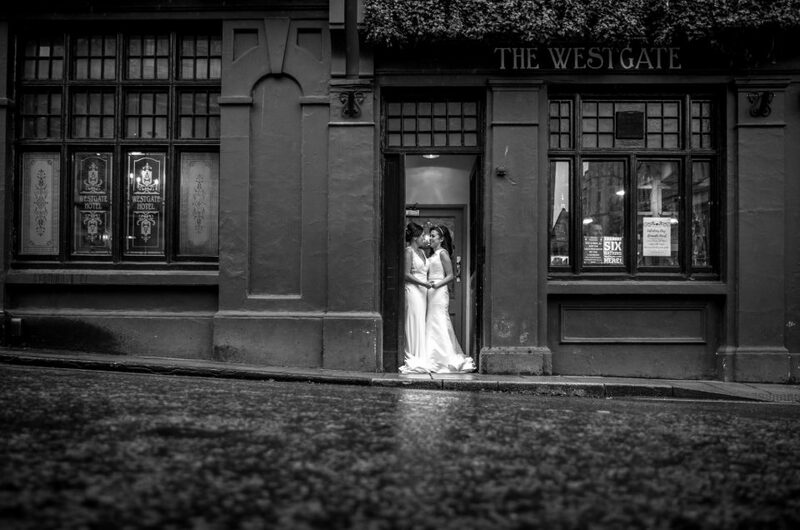 There’s no reason to let a bit of rain spoil your wedding. 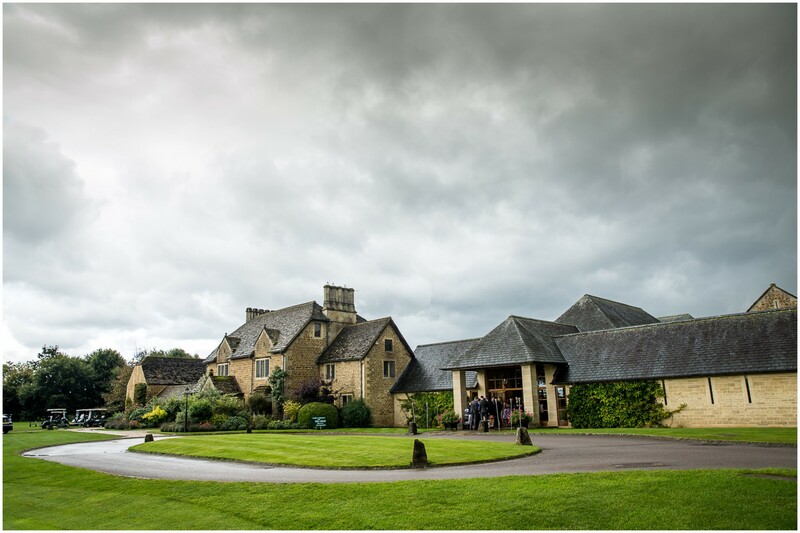 On the Autumn day I joined Ria & Chris at this superb parkland hotel for their celebrations the weather gods chose to throw everything they had at us for much of the day. 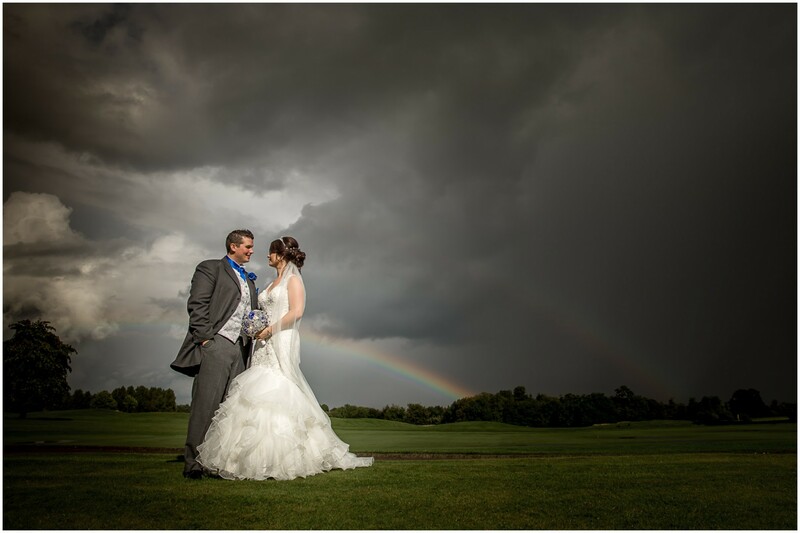 An opportunity for me then to prove my mantra that terrible weather makes for great wedding photographs… turns out I was right! 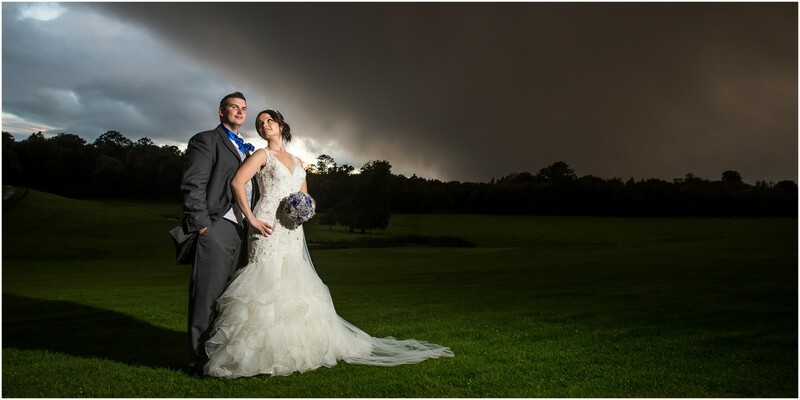 There’s nothing like a heavy sky to add some drama to an outdoor photo, the light after a storm is often some of the most exquisite light a Bowood Hotel wedding photographer can hope to shoot in, and the creative juices are in full flow. 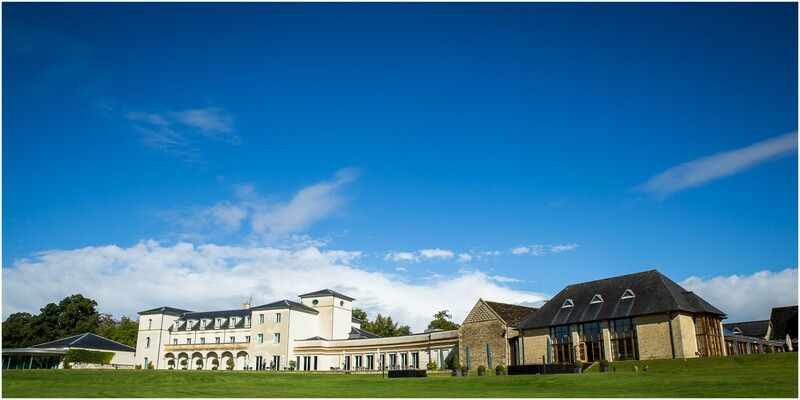 Bowood Hotel is a high-end leisure retreat, spa and golf course sitting on the magnificent Bowood House estate in Wiltshire, near Bath. 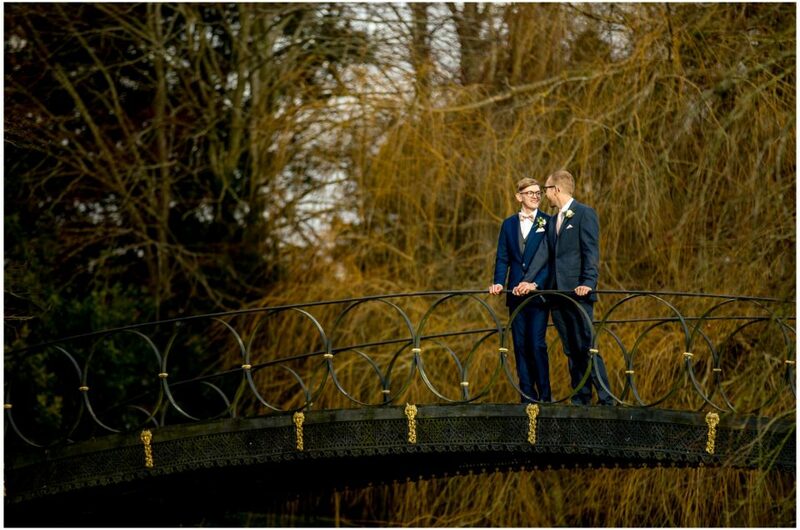 Manor houses, estates and parkland mean beautiful, landscaped grounds for photos, and Bowood Hotel has these in abundance. 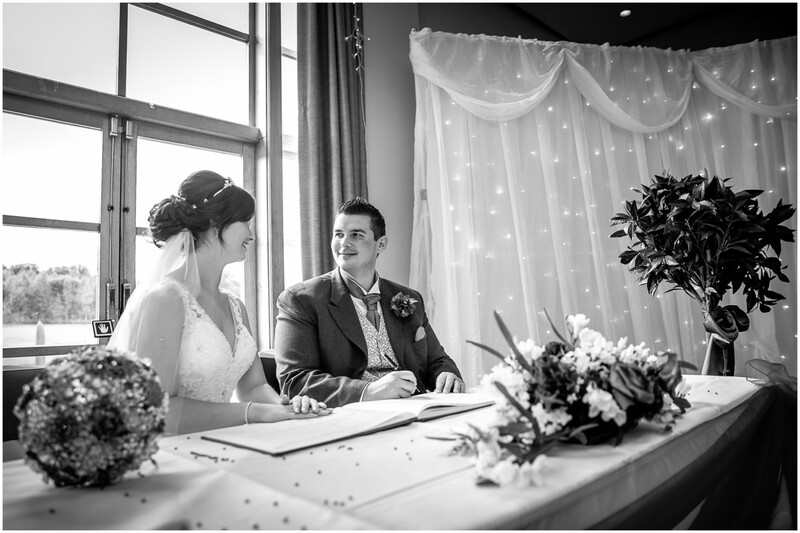 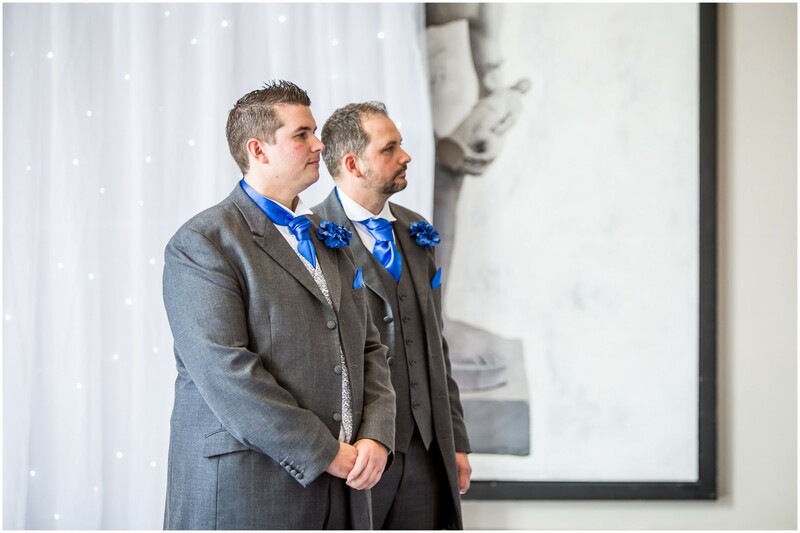 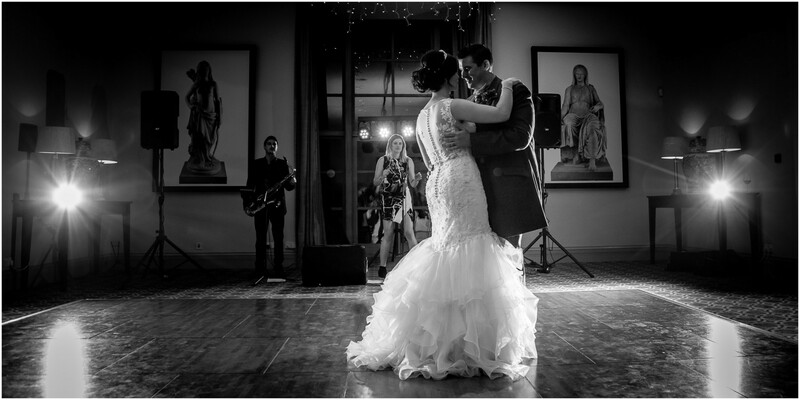 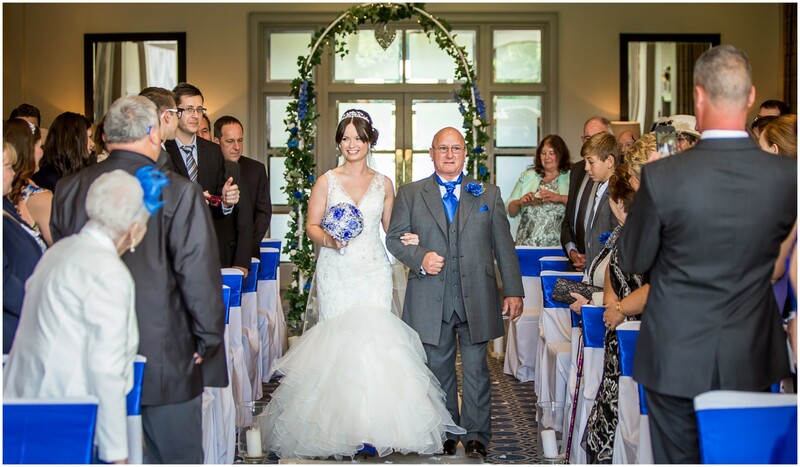 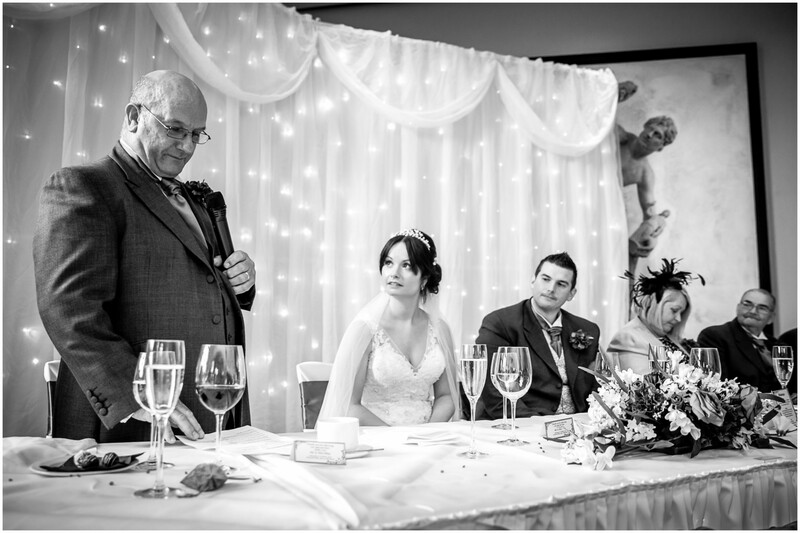 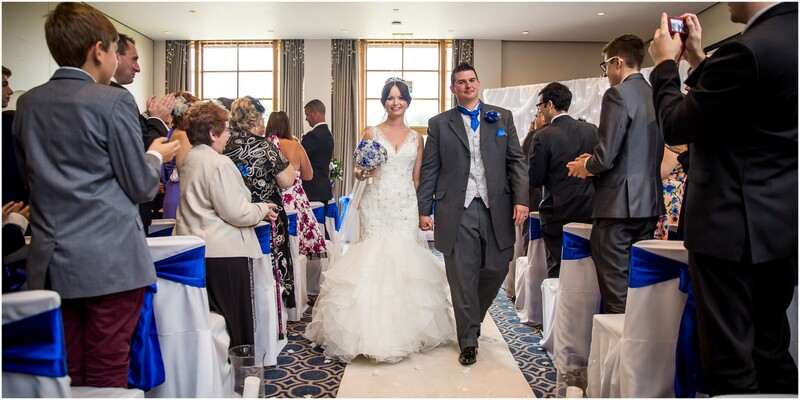 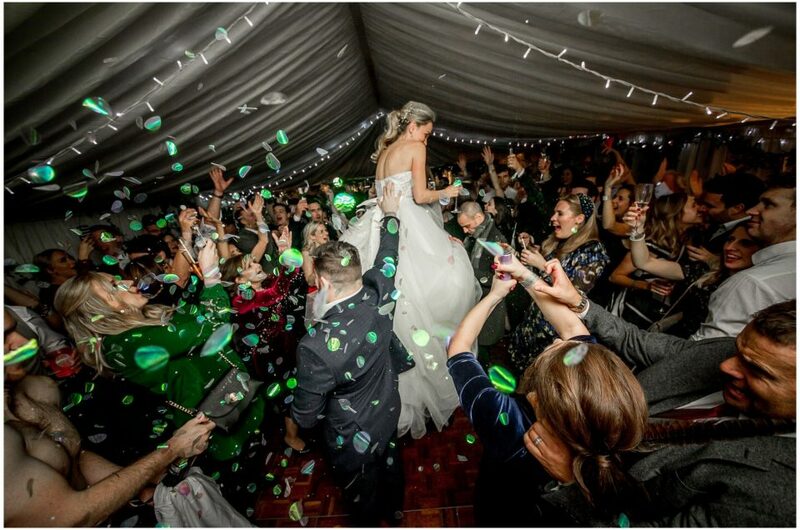 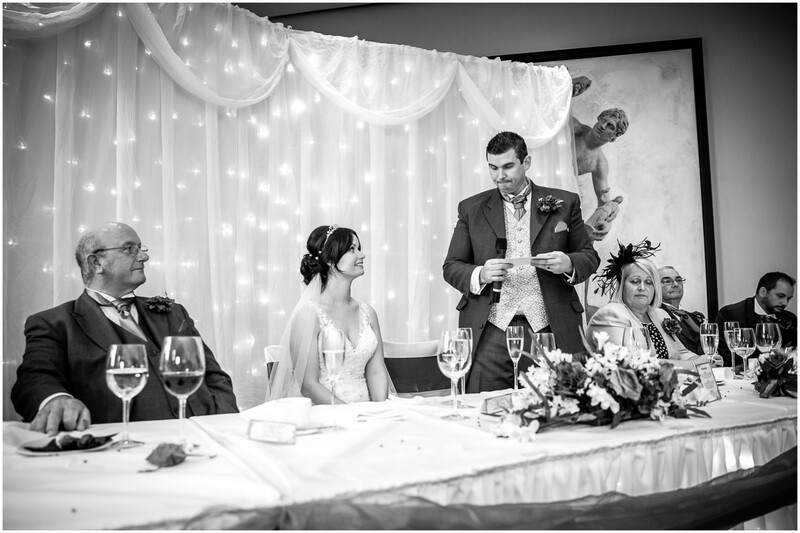 However, if the weather isn’t playing ball, there are still many indoor locations for beautiful photographs both in the main hotel and in the separate club house where the wedding celebrations themselves take place. 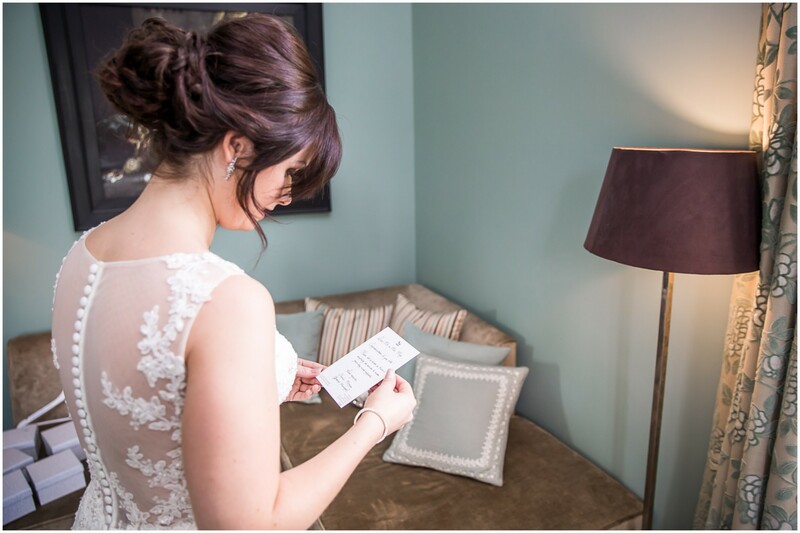 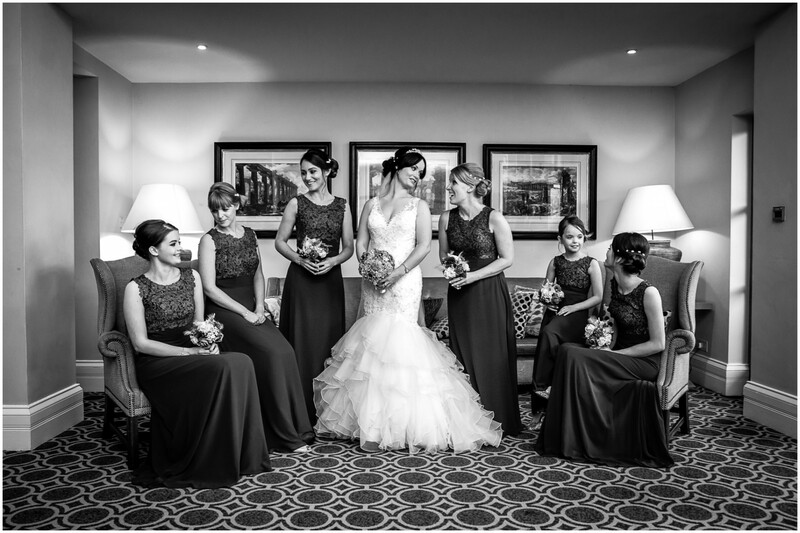 Bridal preparations took place in one of the huge suites in the main hotel – just as well it was so large given the number of bridesmaids and other assorted members of the bridal party in attendance! 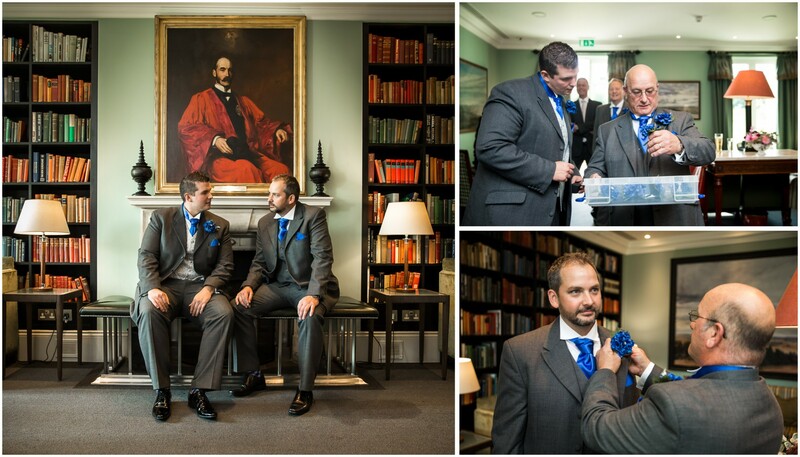 As hair was styled and dresses were laced, Chris kept his groomsmen occupied in the bar and dining room area with the time-honoured tradition of trying to remember how to do a button-hole and handkerchief. 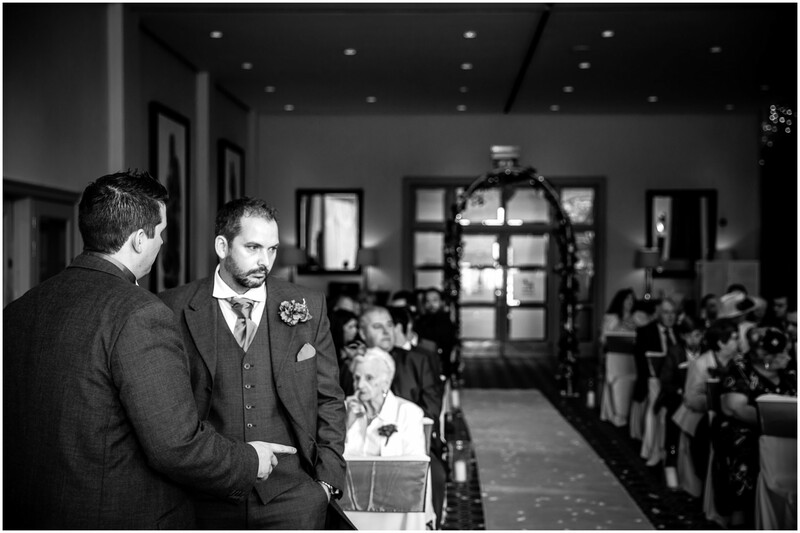 After an absolute drenching on the journey up and all through the morning, a brief parting of the clouds gave us a window of opportunity to shoot across to the club house ready for the ceremony, and Chris took up his position at the end of the aisle, ready to receive his bride. 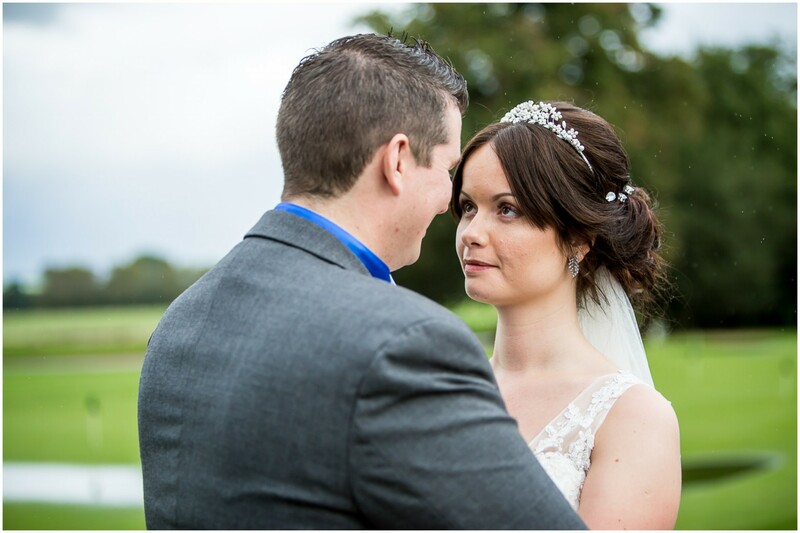 And the sky remained rain-free right up to the point where our newly-married bride and groom walked back down the aisle and prepared to step outside for confetti and photographs. 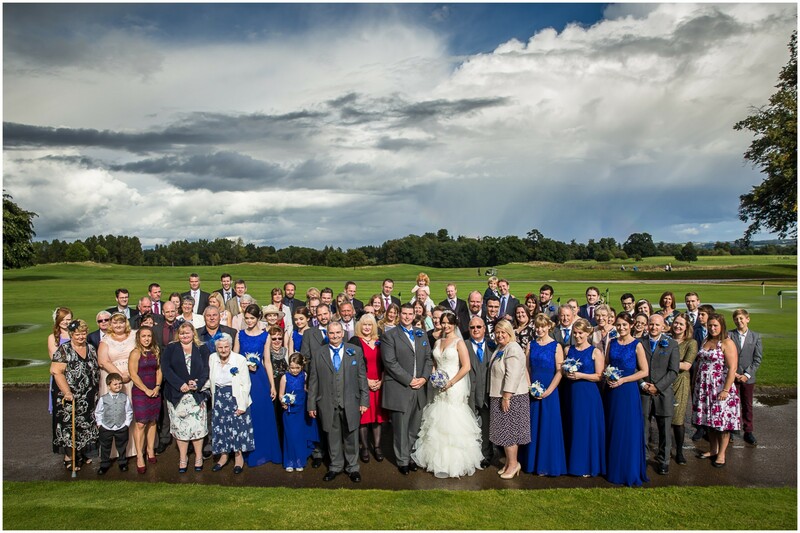 Cue one of the biggest downpours I can remember for a long, long time. 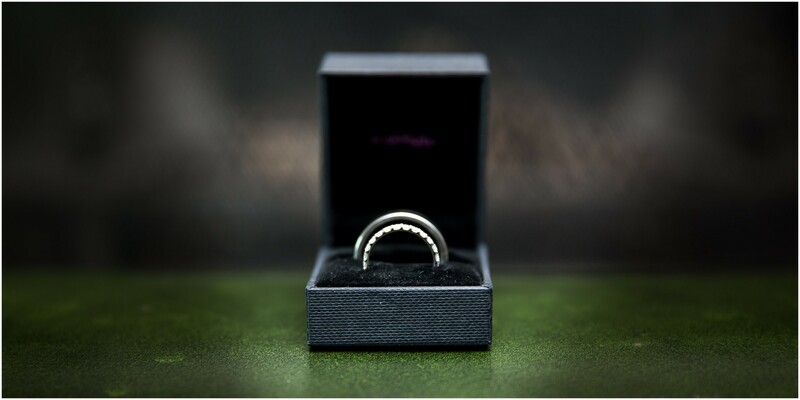 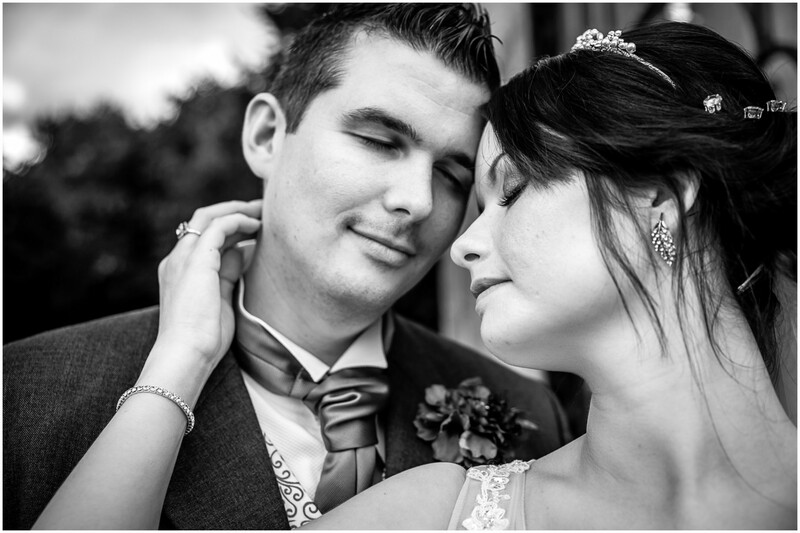 This is when wedding photography can become a real test of the photographer’s adaptability, preparation and nerve. 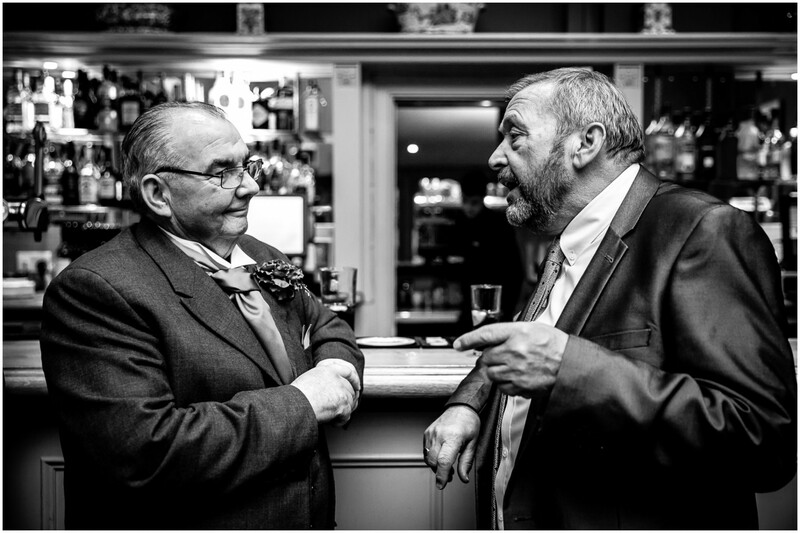 I’m yet to experience a day where the right moments haven’t presented themselves at some point; the trick is in being able to react and seize them as they do. 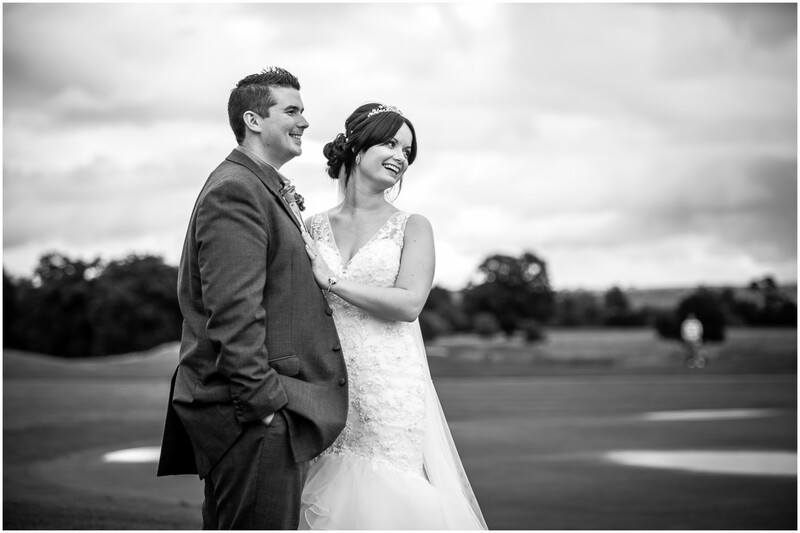 Ria & Chris were absolute legends for this; happily as there are so many gorgeous views and locations right on the doorstep of the hotel we were able to take advantage of them in short little bursts – similarly for the family and group photos – as the clouds occasionally parted. 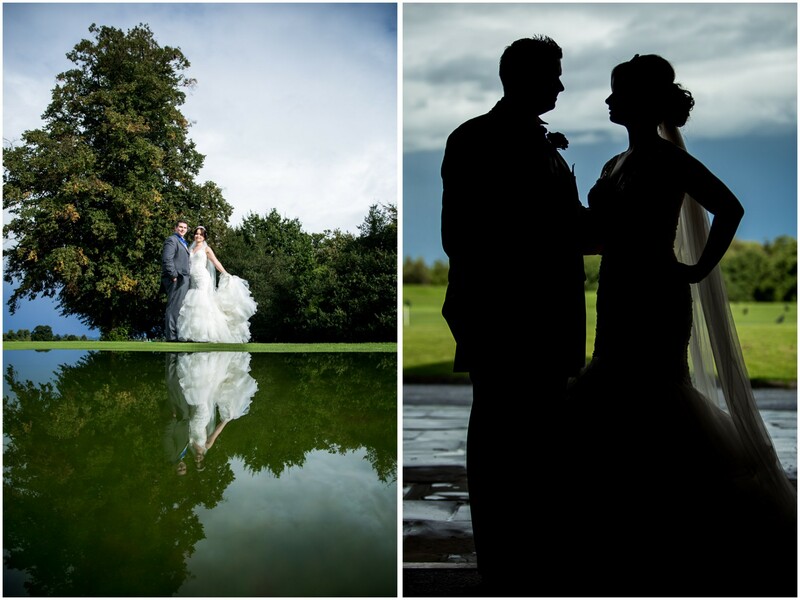 And when, later in the day and as that magical evening light started to show through, the rain really did break, we could then venture slightly further from the hotel to take advantage of some of the big-ticket backdrops that the estate offers… And with a bit of creative use of down-time and having everything ready to go, all of the photographs were covered with barely an impact on the flow of the day itself. 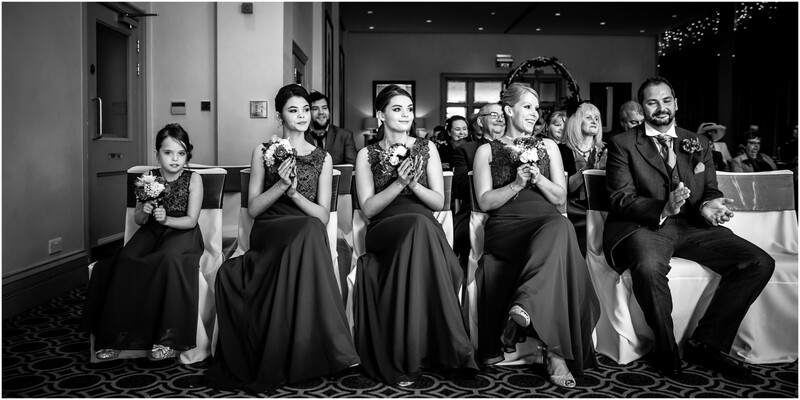 A wedding day is a long day, and I’m yet to see one where everything goes entirely to plan and runs precisely to schedule. 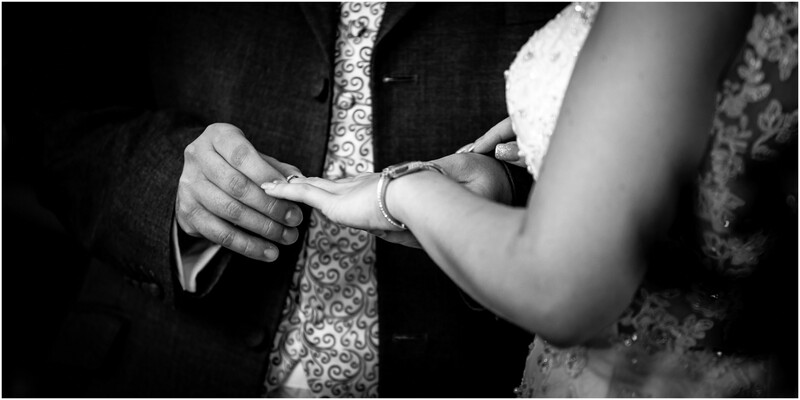 Sure, some occasions call for a little more flexibility than others, but when I’m meeting clients I’m always so keen to reassure them that they don’t need to worry about the things they can’t predict as they are planning their wedding; there are always ways and means, and when it comes to wedding photography at least I’ll be using Ria and Chris’s wedding as an example of how one of the wettest days I’ve ever seen can still result in some of my favourite wedding photos taken in the whole of this wedding season. 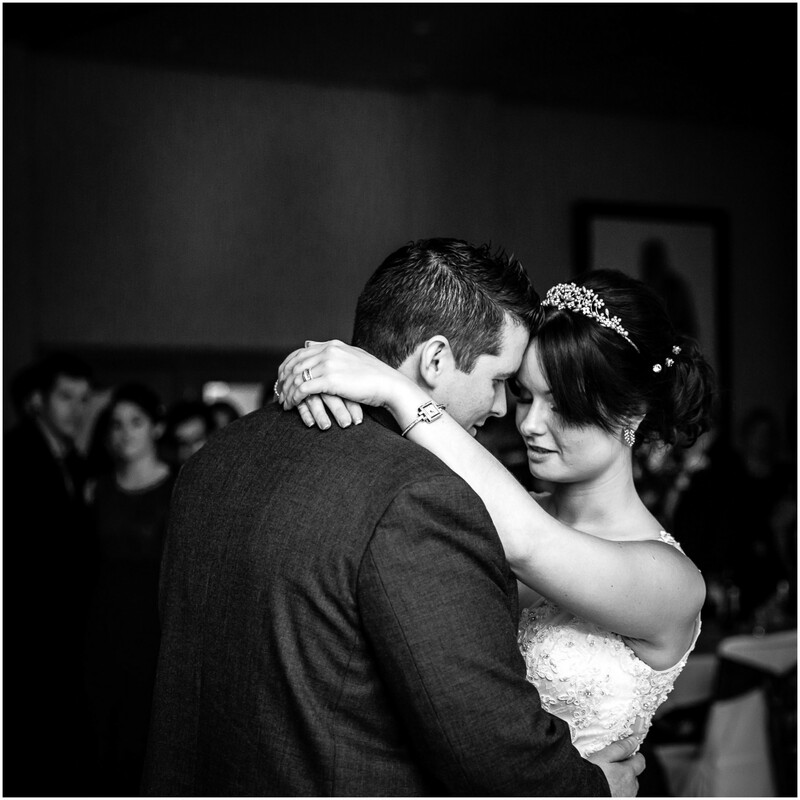 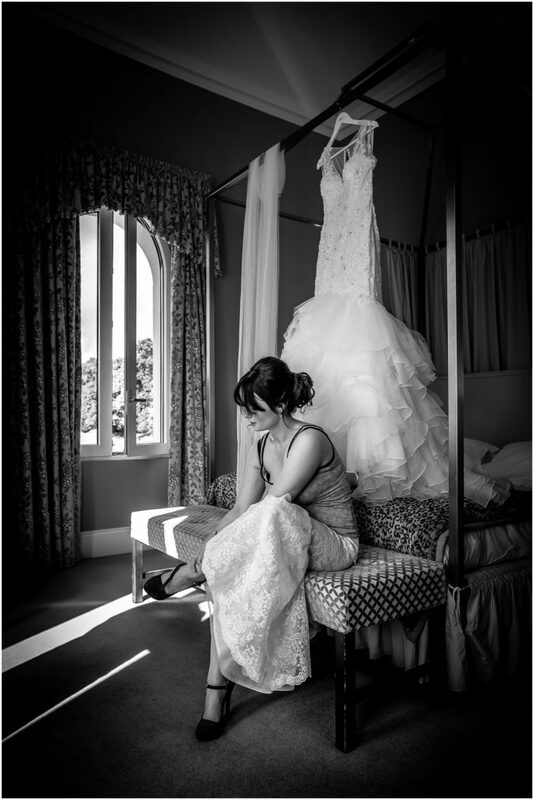 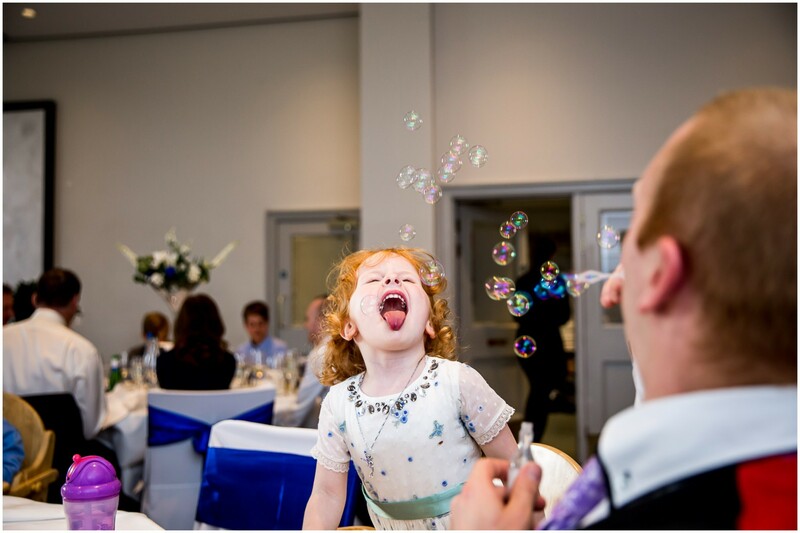 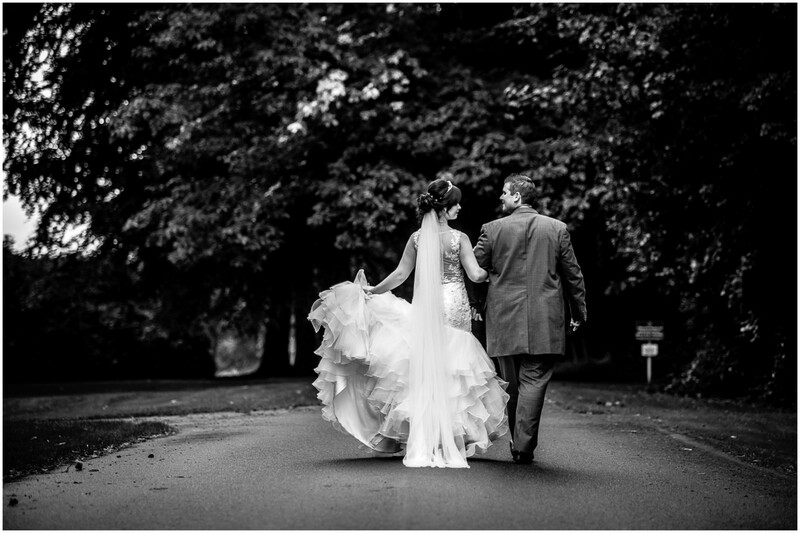 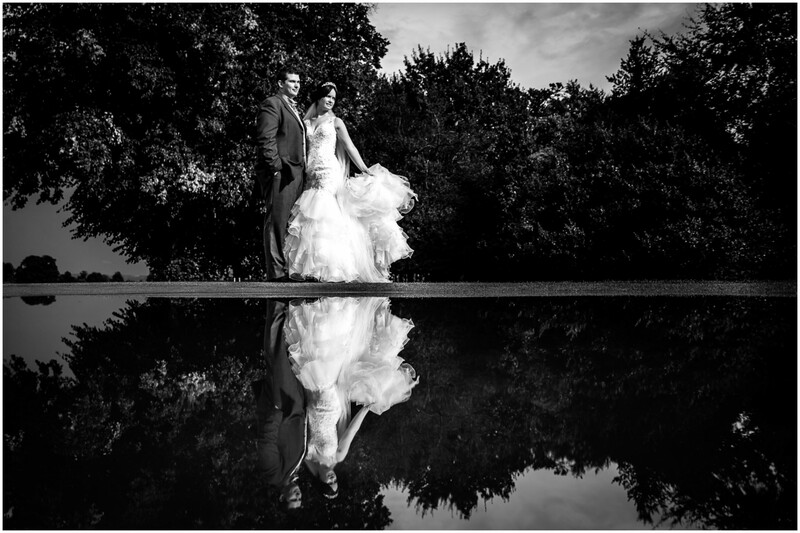 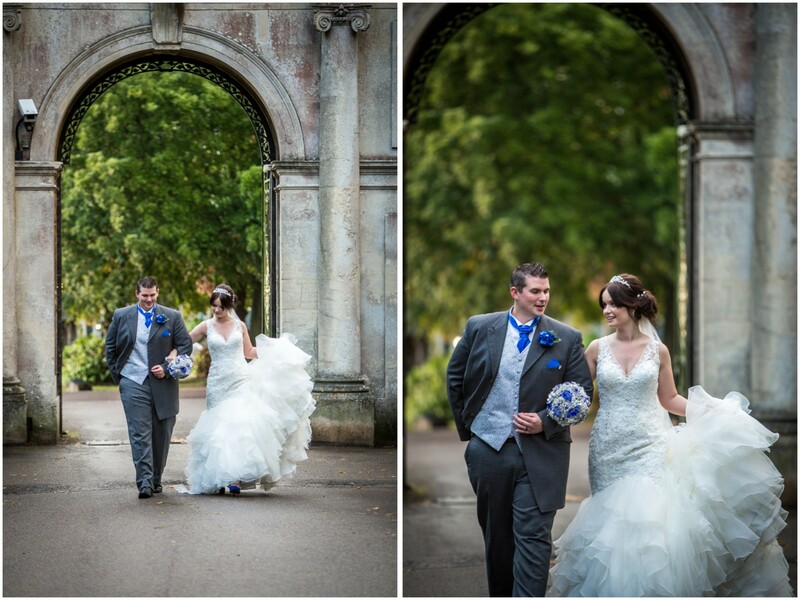 Are you looking for a Bowood Hotel wedding photographer? 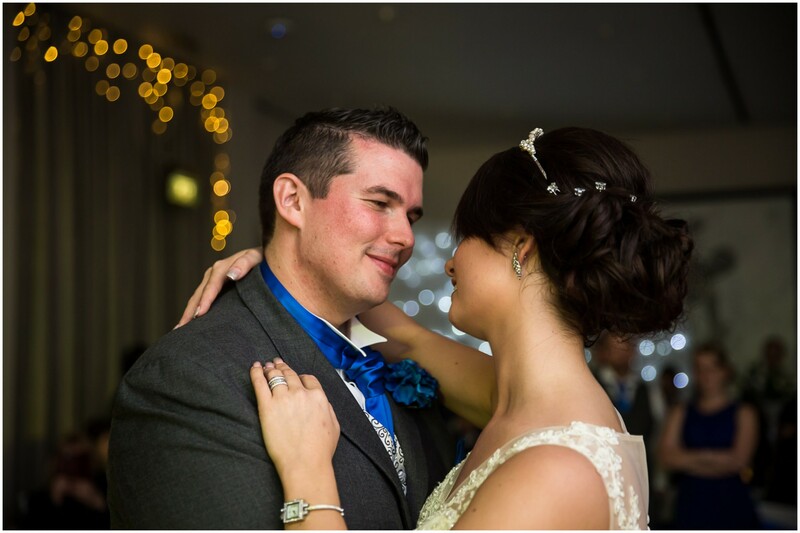 If you are looking for a Bowood Hotel wedding photographer and would like to know more about my wedding photography services, packages and prices, please do get in touch any time to discuss your plans and ask me any questions you might have; I’m only too happy to help however I can.